November 2, 2016|Posted in: Let's Eat! If you love Snicker Doodle Cookies and ice cream, you are going to love, love, LOVE the Snicker Doodle Sundae. It’s so simple to make too! Place a Snicker Doodle cookie in the bottom a serving bowl. (Optional – pop it in the microwave for 15 seconds for a nice warm cookie). Top with one or two large scoops of vanilla ice cream. Sprinkle to top with sugar and cinnamon (you can mix them together in a small container first if you’d like). If you’d like to make use homemade cookies, here’s a recipe. Whisk together flour, cream of tartar, baking soda and salt and set aside. Using a mixer, combine the butter, sugar and vanilla and beat until fluffy. Slowly add the flour mixture until completely blended. Cover with plastic wrap and chill dough for 30 minutes to an hour. Mix cinnamon and sugar together in a small bowl. Heat the oven to 400 degrees f.
Shape large tablespoon size balls of dough and roll into cinnamon and sugar mixture. Place them on the baking sheet approximately 2 inches apart. Bake 8 to 10 minutes until the cookies are slightly browned. 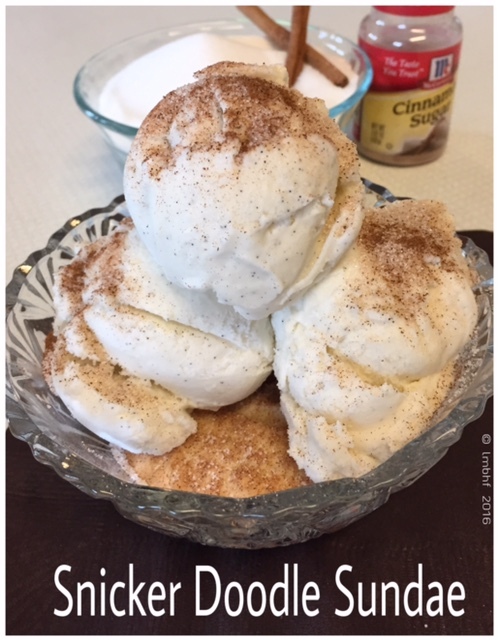 Cool and follow directions above for a Snicker Doodle Sundae! Below are some related products you might like. Click on the photo or the discription and you will be directed to Amazon where you can purchase them.